Beautiful dress. Well made. Good quality. It's was well packaged when it arrived. This dress was absolutely beautiful and so elegant! It fit perfectly and the craftsmanship was outstanding. The service was great and the two questions I asked were answered promptly. 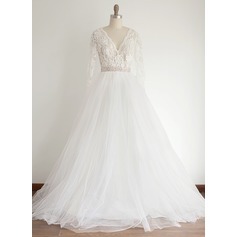 I highly recommend this very lovely wedding dress. After a different dress from another company (aliexpress.com) came in a complete disaster, I ordered this dress. I was pressed for time with 6 weeks until my wedding and was hoping for the best. It came in and was absolutely stunning. I had it custom made to my measurements and it fit like a glove. One of the appliqués on the back was slightly lower than the rest, but nothing my soon to be Mother in Law wasn't able to fix (I never would have noticed it). The dress fit well, was flattering and saved the day! It took exactly 2 weeks to arrive from the day I ordered it. Quality is very good!I love this, it just got here tonight, and it is sooooo pretty! All of my friends say i am so beautiful in it!!!! !Dress will still look stunning. Thank you jjshouse.com! I definitely recommend.Very very impressed!!! This is my 2nd time ordering from JJsHouse and I am impressed with their service and their product. 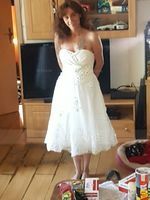 I am so pleased to tell you that my dress has arrived safely today. Thank you so much for your service, The workmanship of my dress is wonderful I will always be grateful to you. thank you again.